The surprise of the day was Bernie Sanders’s victory in Michigan primary. Considering the Google News Ranking there was one publisher who can be declared as the clear winner of the visibility in the Google News Box. For this analysis we have looked closely at four keywords: “Bernie Sanders”, “Hillary Clinton”, “Democratic Candidates 2016” and “Michigan Primary results”. Displayed here are measurements of March 9, 2016. As you can see in these two pie charts there is one clear winner: The New York Times. 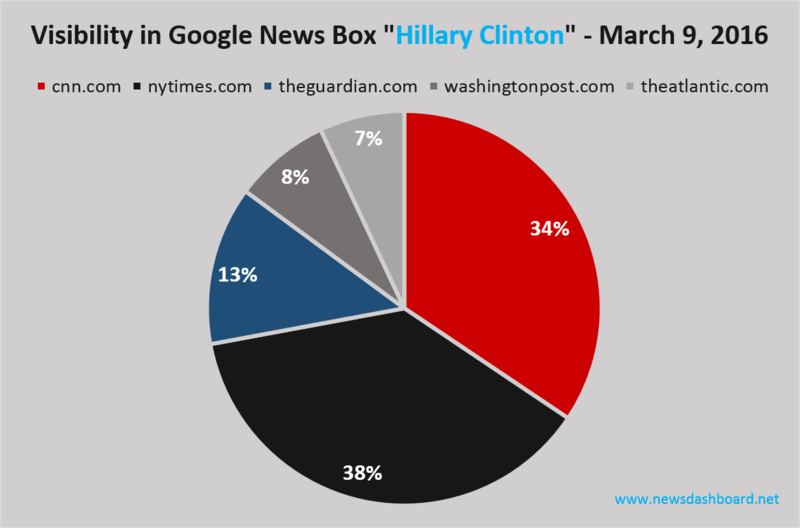 For the Keywords “Bernie Sanders” and “Hillary Clinton” nytimes.com dominates the visibility in the Google News Box with 41% and 38%. The second strongest publisher for “Bernie Sanders” is FiveThirtyEight.com with 17% followed by CNN.com (15%), NPR.org (15%) and ABC News.go.com (12%). 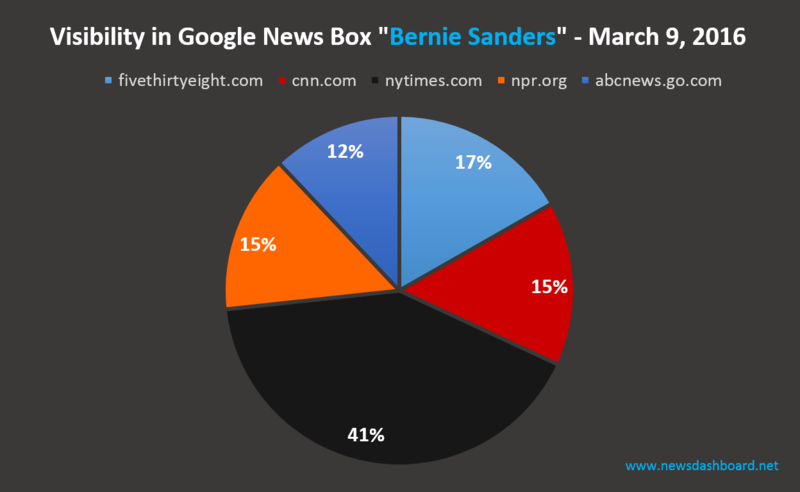 The New York Times dominates the news box visibility for the keyword “Bernie Sanders”. The New York Times also wins first place for the visibility in the News Box for the Keyword “Hillary Clinton” but there is one publisher right on the heels of The New York Times. Having reached 15% visibility for “Bernie Sanders” CNN here has 34% for “Hillary Clinton”. These two publishers are followed by the Guardian (13%), Washington Post (8%) and just behind The Atlantic (7%). CNN on the heels of The New York Times for “Hillary Clinton”. 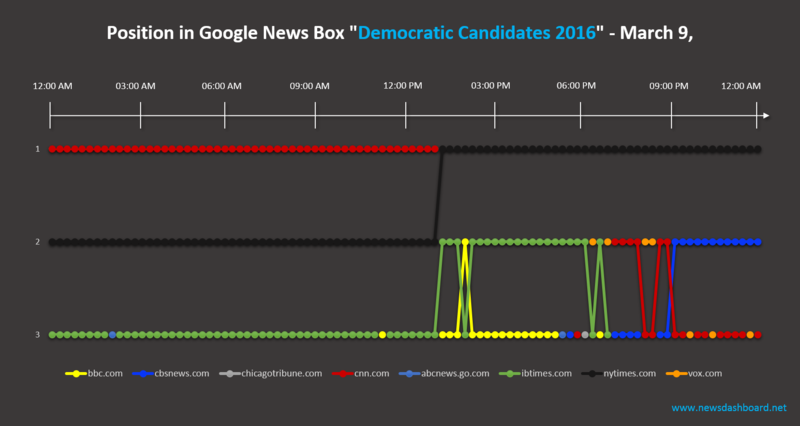 Let’s have a look at the positions in Google News Box for 24h on March 9, 2016. We see that for both keywords The New York Times is the winner and ranks most of the time at first position. Again there is one strong competitor with CNN for “Democratic Candidates 2016”. CNN ranks at first position from 12am to 12 pm and is then replaced by The NYTimes. The publishers at positions two and three are different for both keywords. 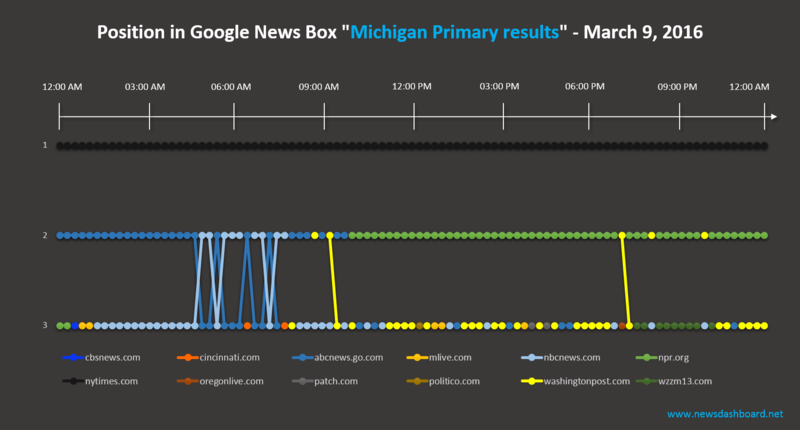 Strong for “Michigan Primary results” are NPR.org and ABCNews.go.com which were also strong at visibility for “Bernie Sanders”. At position three prevailed a strong fluctuation with no clear winner, most likely NBCNews.com. In contrast to that, International Business Times and CBSNews.com were the second and third strongest publishers at position two of the News Box for “Democratic Candidates 2016”. At position three we can declare International Business Times the winner but there are also a few other publishers which rank at this position in the News Box. … but has to share the first position for “Democratic Candidates 2016” with CNN. In summary The New York Times is the strongest player in the race for visibility in the Google News Boxes and therefore in the Google News ranking for these keywords but CNN sometimes strongly catches up.